After the usual to do on Thursday in Moncao, we now have a set UEFA Champions League draw for the upcoming group stages. Since everyone has probably seen the results, I'm going to present each group as the 1-4 was spit out by the UEFA computers for fixture purposes, along with my brief initial thoughts on each group. Group A: Tottenham, FC Twente, Inter Milan, Werder Bremen. I would have loved to see how this group would have played out last year. With all four teams arguably at the peak of their performance, this would have been a fun group. Instead, Twente and Inter Milan have new managers, Werder Bremen have sold one of their key players, and Tottenham are still dealing with nagging injuries from playing in Switzerland. On first glance, I see Inter Milan winning the group with Werder Bremen finishing second. Group B: Hapoel Tel-Aviv, Lyon, Schalke, Benfica. The trips to Benfica and Hapoel Tel-Aviv will not be fun trips for visiting sides. I don't think Hapoel has enough to finish in the top three places, so it's going to be quite a battle between the other three sides to see who advances to the knockout stages. At first glance, I think Lyon will finish first and Benfica will finish in second. Group C: Valencia, Manchester United, Rangers, Bursaspor. I think this is the first true cut and dry group out there. I will admit that I don't think police in Manchester are looking forward to September 12th, as they still remember the last time Rangers fans came to town, but I doubt it ends up as bad as that UEFA Cup Final. I think it's safe to say Manchester United wins this group and Valencia comes in second. Group D: Rubin Kazan, Barcelona, Panathinaikos, FC Copenhagen. Talk about an easy group for Barcelona. The battle for second will be somewhat interesting between Rubin and Panathinaikos. I don't think Copenhagen has a chance of even getting to the Europa League here. To me, Barcelona finishes top with Rubin Kazan just edging out Panathinaikos for second. Group E: FC Basel, Bayern Munich, AS Roma, CFR Cluj. The trip to Cluj won't be a picnic, but this is a pretty cut and dry group. I think Bayern Munich win it with Roma coming in second. Group F: Chelsea FC, Marseille, Spartak Moscow, MSK Zilina. The two trips to Eastern Europe will not be fun for Chelsea or Marseille. I think Marseille are the wild card in this group, but I don't think it will matter much. I think Chelsea win this group with Marseille finishing second. Group G: Auxerre, Real Madrid, Ajax, AC Milan. By far, this is the mythical group of death. AC Milan maybe down, but they are still a tough ask. Real Madrid has Jose... enough said. Ajax has plenty of good talent, but can they put it all together? I really feel for Auxerre: if they were in any other group, I'd rate them to advance. 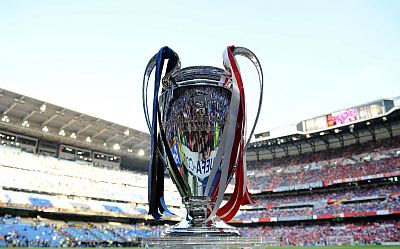 I think Real Madrid will finish top with Ajax finish second. Granted, I'm sure to change my mind about this group about a dozen times between now and the start of group play. Group H: Partizan Belgrade, Arsenal, Sporting Braga, Shakhtar Donetsk. I don't think Arsenal are going to enjoy the three away trips they will have to make, and it should open up this group. Sporting Braga are better than most realize. I will admit to not knowing much of Shakhtar and Partizan outside of knowing they make things uncomfortable for the rest. Right now, I think Sporting Braga will win this group, with Arsenal coming in second. What are your thoughts on this draw? Right now, who do you see advancing to the knockout stages? Let us know in the comments below.